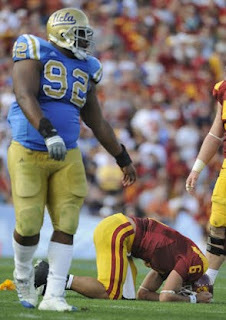 Gotta give it to Reggie Bush. He picked a great time to finally show up. 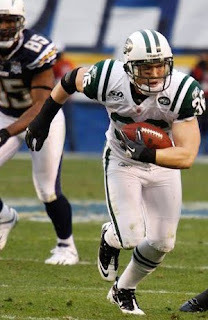 For the pat myself on the back moment....I believe I was the only person in America who though the Jets matched up well with the Chargers. Yeah me! If it's true that the Falcons jeopardized Matt Ryan's long-term health by playing him in the final three games of the season despite a lingering turf-toe injury then they are the dumbest people on the planet. Derek Dooley? Really, Tennessee. That was the best coach you could have gotten. Why not Randy Edsall from Connecticut? He took a not program in Stoors, with absolutely no recruiting base, and made it one of the better mid-level programs. Dooley, who may turn out to be fine, hadn't done anything at La. Tech. I, for one, hope Ben Sheets is fine. When healthy, Sheets was a young Roger Clemens, and I hate to see a talent like that have his career be destroyed by injury. PFW looks at the Patriots defense and sees many plays that were "miscast". Frankly, miscast is just another way of saying "not as talented." I think that trade of Mike Vrabel was a bad idea and hurt the Patriots more than they expected. Good move on the Dodgers trying to sign their young talent to extensions. Signing their young talent and going after low-risk high-reward players like Joel Piniero is a very good move for building a good base for the team. When Torre got there, the team was a divided mess with old players pushing management not to play younger players. Since then, Torre has gotten rid of Luis Gonzalez, Nomar Garciaparra, Derek Lowe, Juan Pierre and Randy Wolf and Takashi Saito—and with Jeff Kent retired—and has invested time to younger players like Matt Kemp, Andre Either, Chad Billingsly, Clayton Kershaw, James McDonald, James Loney and Jonathon Broxton. The Dodgers have then gone after with low-risk veterans like Pineiro, Nick Green and Vicente Padilla. One guy not getting enough buzz by the draftniks right now is UCLA DT Brian Price. Price had 23.5 TFLs this year—including 2 each versus USC and Oregon—7 sacks and 2 forced fumbles. Right now, he's not even in Scout's top 32 players, which strikes me as odd. if some team picks this kid up in the 2nd round, they may have a steal on their hands. The second Brett Farve threw that TD with less than 2 minutes left in the game, I knew somebody on the Cowboys wasn't going to be happy. Another thing, why all the hate for Tony Romo? The guy was sacked 6 times, hit 10 more, and basically had his offensive line act as if they were revolving doors. How is this loss all his fault? For AAPTBNL Man of the week, I gotta give it to the Jets defense. Taking a team that averaged 28 pts a game, and shutting them down for 7 points until the lat 4th quarter when they went into a soft prevent defense......outstanding. So to Mike Pettitte, Rex Ryan, David Harris, Jim Leonard and the entire Jets defense, congrats on a great win. And finally, we'd like to give our condolences to the family of Gaines Adams. 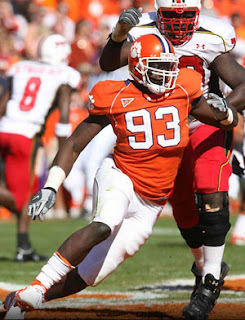 At only 26, Adams, a former number 4 pick out of Clemson, died of Cardiac failure yesterday. While it may have had been the result of doing, as some have already suggested, it's too early to speculate on that. Rip, Gaines, and our wishes and prayers go to your family. P-Cat...glad to see your still writing this blog at a high level. Poor Revis. If Woodson had not had one of the best years for a cornerback in recent memory (3 picks for TD's and 9 total), he would have been a shoo-in for Defensive Player of the Year. However, Revis is still proving his value. He had another spectacular pick against the Chargers. What a weapon he is in a defense that is perfect for him. I wish the Jets luck, because they win their games with such grit. It's impossible to root against them. Thanks for the compliment Pete. Always glad to hear from you. Revis is amazing. Didn't see all of Woodson's games, but it would be hard to imagine anyone playing better than Revis did this year. Well, if Keith Brooking was upset about the TD maybe they should have stopped the Vikings.